This is a reminder of the originators of our art - the Chinese. It is in respect to them, but not that we serve them. The lettering to the right means Kenpo Karate - Law of the Fist and the Empty Hand - the art that we practice. To the left it means spirit of the dragon and the tiger, a constant reminder that we want to attain the spiritual level and that the physical level is only a stepping stone or vehicle that we use to reach the higher or spiritual level. The Axe shape represents the executioner, in the event a member is influenced by evil ideas and thoughts contrary to our philosophy or shames the I.K.K.A. organization then he will be cut off, never to coexist with us again. In this concept of focus one visualizes a white dot on a black background representing unawareness. All styles and systems that primarily stress linear motion conform to this concept, their concern is with the target and with maximizing power, not protection. First, the mountain we are trying to climb for perfection in our daily lives and the Martial Arts. Second, three points of view, this refers to a bystander’s point of view, it is how he views the encounter’s he develops sequential patterns of defense and offense, it is highly recommended that you consider his point of view, for it may reveal other existing openings or uses of natural weapons that you may have otherwise overlooked. This point of view increases your ability to observe additional openings or counters that you may have missed if you were only to consider the first and second points of view. 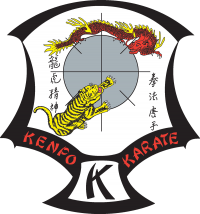 This badge was designed for a lot of reasons, first for respect to Mr Parker for finding the art and devoting his life to I.K.K.A and Kenpo and the time he spent with our instructors here in Jersey. For Mr Macdonald who has devoted 30 years of his life to teaching Kenpo, his time and endless effort to carry on in Mr Parkers footsteps and to keep Kenpo alive, which if you ever visit Jersey, you will no doubt believe. Mr Macdonald is an 8th degree Black Belt, holding the highest Kenpo rank in Europe. The red and white band represents our club here in Jersey the colours are as in our flag and will keep you up to date with what’s going on here in Jersey. It also represents the circle of friendship as all are welcome. Top American Instructors share their knowledge at Master Class weekend! Copyright © 2019 Jersey Kenpo Karate Association. All rights reserved.